Assessment of system conditions and standards of maintenance. Building Services Research and Information Association (BSRIA) Technical Note TN 18/92 "Ventilation System Hygiene" - a review. Workplace (Health, Safety and Welfare) Regulations 1992, Regulation 5 and section 33 of the Approved Code of Practice. Assessment of filtration efficiency in relation to airborne particles. Workplace (Health, Safety and Welfare) Regulations 1992, Regulation 6 and section 29 of the Approved Code of Practice. 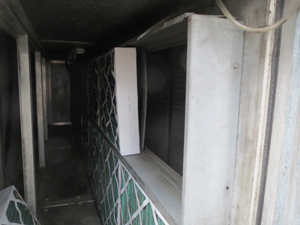 Checking the Cleanliness of Ventilation Systems. Workplace (Health, Safety and Welfare) Regulations 1992, Regulation 5 and section 22 of the Approved Code of Practice. Air sampling to determine contaminant types, quantities and sizes. Control of Substances Hazardous to Health (COSHH) Regulations 1994, Regulation 6. HSE Guidance Note EH40 "Occupational Exposure Limits"
HSE Guidance Note HS(G)173 " Monitoring strategies for Toxic Substances. HSE Guidance Note EH46 "Manmade mineral fibres American Society of Heating Refrigeration and Air Conditioning Engineers Guidelines. Control of Substances Hazardous to Health (COSHH) Regulations 1994, Regulation 10. Biological Approved Code of Practice, Section 22.